Up to this point in time I’ve kind of avoided the Dashboard on my Mac. Having had bad memories of the Active Desktop in previous versions of Windows I’ve just avoided the genre. I played around with Mac’s Dashboard a little last night and found it to be pretty cool though, making me rethink whether or not this is something I want to make part of my daily routine. The number of widgets available from Apple for the Mac Dashboard is simply staggering. Since the widgets can be built really easily using Dashcode, Apple’s development tool for these widgets, it’s just painfully simple to create a Dashboard widget. The cool part is that you don’t even need to use Dashcode to create a nice little Dashboard widget – you can just grab what you want directly from Safari. Up in the Safari toolbar is the little scissors icon that allows you to select a chunk of your current web page and simply make a Dashboard control out of it. I’ve only just started playing with it but any site you visit frequently that has an RSS feed would be a good candidate for a Dashboard widget. It’s so simple it’s ridiculous. So this morning as I was writing up this entry and I fired up Dashcode (needs to be installed from your original Mac OS X CDs or downloaded from Apple). I started playing around and before I knew it I had created a Dashboard Widget for my blog. 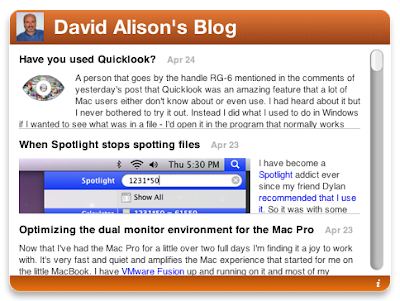 You can check it out here: David Alison’s Blog Widget. It’s not much but also took me all of about 20 minutes to produce, and that was from fumbling around trying to figure out the UI for Dashcode. It really is that easy. If you find yourself looking to express yourself on the Dashboard try out Dashcode – I have a feeling it’s going to contribute to how I deliver my next product. So here’s a question for all of you: Do you use the Dashboard? If so, is there a "gotta have" widget you really use all the time?